Funny and fantastic is the tale of StorySide:B's beginning. That a talent search on Christian TV's Trinity Broadcasting Network (TBN) could lead to the formation of Gotee Records' newest rock band deserves some investigation. StorySide:B founders Lucio "Lu" Rubino (frontman/guitar) and Jordan Mohilowski (drums) entered the Exalting Him 2003 national talent search, which aired internationally on TBN. Winning the band division, the guys finished second place overall. Rubino says, "Participating in this contest was the encouragement that we needed to move forward in our musical journey and continue to follow God's path for us." Rubino and Mohilowski then returned to St. Augustine, Fla., and continued working on the growth of StorySide:B, playing for several thousand kids at Youth Quake events in Florida and cutting a 5-song EP. Eventually bass player Ron McClelland and guitarist Matt Lande joined the line-up about the same time that Air1 radio network picked up the single "More To This Life." Shortly thereafter, StorySide:B rounded out its live sound by adding Preston Pohl on guitar in fall 2004. Line-up set, the band started playing for labels in Nashville. "We showcased our music for Christian labels, not really to see who liked it but to see who could relate to it," says Rubino. "We had such a strong team in place and we wanted to keep that flow, working with people who had the same vision." Gotee president Joey Elwood heard the band play an acoustic set-a month later the guys met with label founder TobyMac. "We met backstage after one of his shows and played some tracks for him on the tour bus." That meeting led to StorySide:B signing with the label this past spring. Individually digging in while gelling together as a band, StorySide:B recorded its debut project, Everything and More. 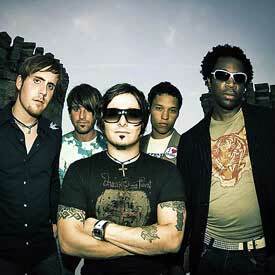 Produced by Rubino and mixed by J.R. McNeeley (Relient K, Jeremy Camp), the music is straightforward, melodic rock. It powers through from start to finish, touching every point of rock in between. Band favorite "It's Not Over" and first single "Miracle" go far in capturing StorySide:B as layers of guitar create rich melodies that support the band's clear, universal, God-inspired lyrics. "We are a rock band, playing positive rock and creating real, hopeful music that talks about relationships, whether directed at God or other people. We're sharing what works for us," Rubino says. Themes on Everything and More promote positive relationships and challenge listeners to search deeper and find encouragement-such as "More to This Life," a song written about one of Rubino's friends who died of melanoma. "That song just reminds us to take the opportunity right now to be thankful, to make the choice everyday, to recommit to life, to find balance, happiness and oneness with God." Album opener "Hold Me Down" also speaks straight to the idea of relationships. "It's about taking things that are negative in your life and getting rid of them," says Rubino, "and surrounding yourself with the right people." "In our songs," adds Mohilowski, "I want us to write about the things that apply to people's lives and offer encouragement, to write about relevant and relative subjects that can apply to anyone-and just be honest! I want people to hear the band for the first time and say, 'That's exactly what I'm going through.'" "We see our songs as planting little seeds because even those can't be discounted," says Rubino. "The feedback that we've gotten from fans, saying that a song has touched them or spoken to them, that makes daily chaos and worries worth it. You can again take a deep breath and find the reason why you're doing this."